When you dream about being awake before your alarm goes off: You forget that you haven't done things that you are supposed to do. This morning, I was dreaming about being awake and going to the gym before my alarm went off and I got up to go to the gym. So, my head really wasn't all there when I got dressed. Usually, I put on my gym shorts, then my track suit pants, along with socks, sports bra, t-shirt, and shoes. This morning, somehow, I forgot the shorts. Now, this isn't the biggest mistake in the world, but the thing is, I didn't notice until I was at the gym...removing my pants. In the cardio room. Oops. Good thing no-one was looking at me - they were too busy watching the weather report that way telling us to be prepared on Thursday and Friday for Icepocalypse 2010 2.0. So there is your laugh at Hope moment for today. I certainly did, once I pulled my pants back on. Straight - grab a handful and toss it back. That is what I have done for dessert the past few days. Mixed in with yogurt - I use homemade plain, Benjamin uses Wallaby, various flavors. The tartness of the yogurt contrasts nicely with the honey sweetness of the fruit and oats. Sprinkled on top of ice cream - self-explanatory, and possibly better than chocolate sauce. Baked into bread - I have not tried this myself, but have several recipes for granola bread. I am not sure it is necessary, since oatmeal bread is granola without the oatmeal flakes being baked. I suppose if you had a special type of granola...but the granola I made this week is far too good to waste in bread. Our friend Amber gave us a bag of homemade granola for Christmas, little knowing what she would set off. It was a lovely, fruit-filled granola - with figs, dried apricots, craisins, dried cherries, almonds, cashews and coconut. You can't get granola like that at the store, even Whole Foods. There, the granola only has one fruit, maybe two at most, with little crunchy puffed rice and other sorts of grains. And it isn't fresh. So, after we devoured our gift bag, I began to beg for her recipe. This weekend, I finally got it, and was at Whole Foods, so I could get all the dried fruit. I made a batch, and as soon as it was mixed together, we started munching on it. Last night, I had granola for dessert instead of mint cookie ice cream...on purpose! I mean, I chose granola over ice cream, because I wanted it more. I have been eating it with my homemade yogurt for my morning snack. Seems like in addition to baking my own bread and making my own yogurt, I am going to be hooked on granola too. Here is the recipe. Amber and I are fiddling with it, to see if we can make it even better, but this is the basic recipe. When completely cool, store in an airtight container. Might want to make it one that is hard to open, or it won't last very long. Addendum: I just found this recipe on the internet, and it looks like it may originally have come from Nantucket Open-House Cookbook by Sarah Chase. I may have to check this book out at the library. Charity Navigator's rating system examines two broad areas of a charity's financial health -- how responsibly it functions day to day as well as how well positioned it is to sustain its programs over time. Each charity is then awarded an overall rating, ranging from zero to four stars. To help donors avoid becoming victims of mailing-list appeals, each charity's commitment to keeping donors' personal information confidential is assessed. This information includes the CEO pay, how much money goes to fund-raising and operational costs, versus how much goes to actually doing their charitable work. The Better Business Bureau also has a database with information about charities for donors. This week is crazy at work. The State Library is in the process of moving from one building to another, and let me tell you, moving a library is no fun. We didn't have to move the books, thank goodness, but that still left a lot of, well, stuff, for us to deal with. The actual moving process is almost complete; now comes the reorganization and the re-configuring. Sigh. On the plus side, the new building (really an old one that was retrofitted) is nice and shiny. And my commute is about 5 minutes shorter each way. On New Year's Day, we set out on our first hike of 2010. It was a spontaneous decision - the sun was out, our colds were in retreat, and Benjamin needed to get out of the house to avoid going stir crazy. Because we hadn't really planned to go away for the day, we needed a hike that wasn't too far away from home. And because I was still suffering from my head cold, I didn't want to have to do a lot of up and down hiking, which ruled out Pinnacle Mountain. 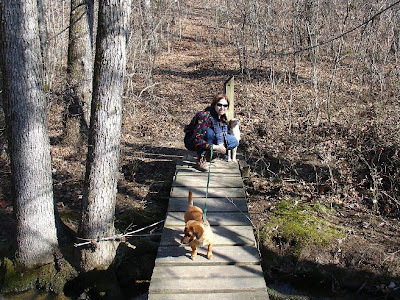 We have been to Woolly Hollow before, right after we moved to Arkansas, but we never did the 3.5 mile loop around the lake. It is about an hour's drive away from Maumelle, up north, outside of Greenbrier. 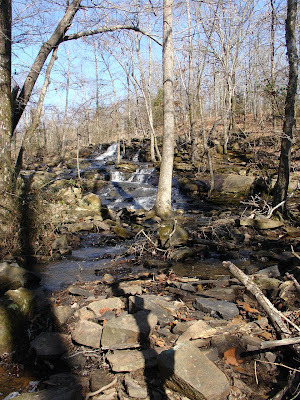 It is a state park, and is named after an early settler family, the Woollys. 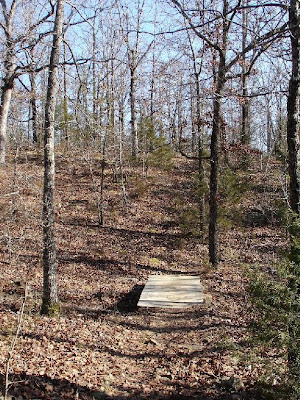 Our Tim Ernst guidebook says that the woods are lovely in the spring, with many patches of wildflowers. No wildflowers in January, but the woods were still lovely. The abundant sunshine didn't hurt one bit. 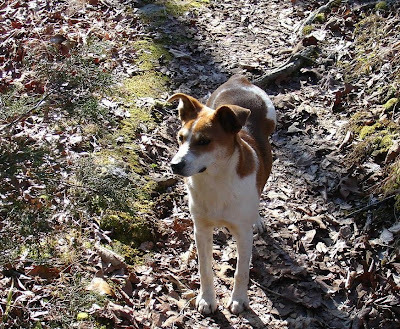 We had a tag-along guest on the hike - a stray dog we nicknamed Ralph. Another hiker who was leaving as we started the hike said that he had followed her on the trail around the lake, and that he was friendly. After some initial sniffing, Miikka decided that Ralph was far less interesting than the trail. They played a bit when we stopped to take pictures, but otherwise, Miikka pretty much ignored him. That was something of a relief, because a distracted Miikka is almost impossible to walk. 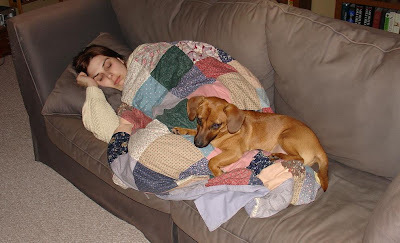 When I told Ralph to stay behind me and out of the way, he did. He was very well-mannered and friendly. 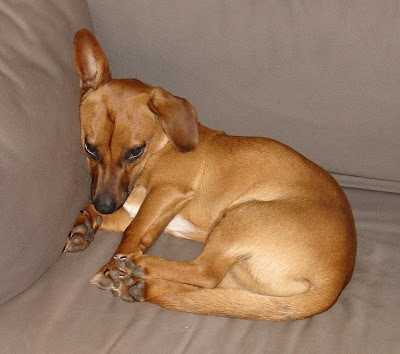 Since he didn't have a collar, we assumed that he was a stray, or a dumped pet. I began to worry that I would have to take him home, because despite the sun, it was cold, and I hate seeing animals suffer. He was in good shape, however, and seemed only to want to go for a walk with us. As soon as we got to the end of the trail, he ran off to find someone new to go hiking with. I can only hope that the park employees were looking after him, or that he was someone's pet who just happened to be good at losing collars. Here we are again, a new year. It is 6 days in - have you broken your resolutions yet? I am not making any this year; even if I don't break them, the idea of a New Year's resolution in July seems kind of silly. It seems better to just start a new form of improvement or a better habit whenever you think of it, rather than waiting for a specific time of year. That being said, I did join a gym, sort of, and started a work out plan. We have a community center a half mile from our house that has a pool (outdoor, and only open during the summer), a weight room, a cardio room, a running track and basketball courts. The only thing it is missing, from our point of view, is a racquetball court - we still have to drive to Conway to play. Benjamin stopped by to pay up and get our passes this week, and this morning, I managed to leave my nice warm bed (it was only 20 outside) at 5:20 and go work out. If I can keep it up, I intend to go several mornings a week to work out. Walking Miikka is good, but it doesn't really get my heart rate up (too many stops to check out trash or sniff an invisible spot). I don't need to lose weight (although I won't mind if I do), but I do need to get back into shape - sitting at a desk all day isn't great for one's hiking endurance! And I want to be in hiking form, because I want to do more hiking this year. We were able to go hiking at least once every month (except one, I think) this past year, and would like to do that again this year. Hopefully, we will also be able to add a few more overnight hikes to the day hikes. Another intention for 2010 is to read 100+ books again. I read 109 in 2009, down from 2008 - but I was unemployed for the greater part of that year. My dad read 91 books, or 35, 296 pages last year. Maybe I should keep track of pages too... Anyway, you can check out his book reading, and see some great pictures, at his website. I have added a link to my web places so you can check up on him. Here is Miikka in his favorite spot - the corner of the couch. It has been so cold lately that he is usually curled up in a little ball with his nose tucked under his tail or a paw...not that he minds the cold when he is out running around in the yard. When I take up his spot on the couch, he just sits on me. 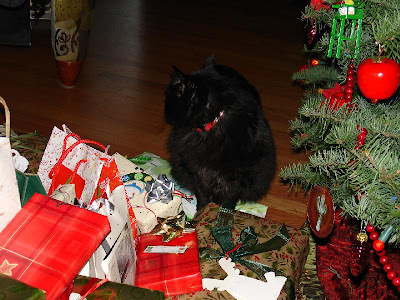 One of my mom's cats, Sadie, contemplates the pile of gifts under the Christmas tree. Several of them had her down as the giver, but alas, none as recipient. 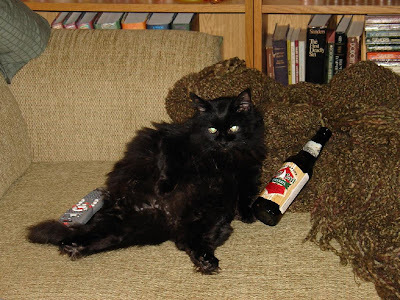 Sadie likes to hang out and watch TV with a beer - not very ladylike there, Sadie! 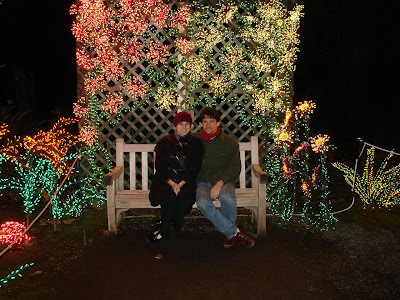 One of the many fun activities we did while in Bellevue for Christmas was to visit the Bellevue Botanical Gardens light show, Garden d'Lights. 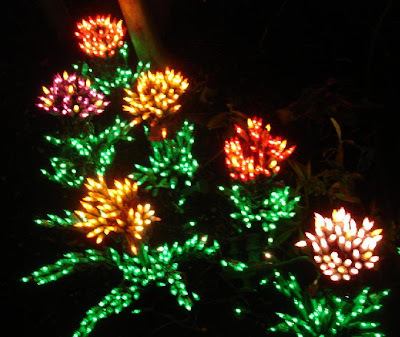 This is a large, and even though I am not given to using words of such magnitude, splendid, display of lights. 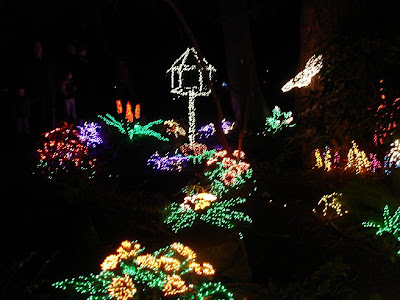 When it started 10 or 15 years ago, it was just a few clumps of lights that were designed to look like grapes in an arbor, and a few flowers. Well, it has certainly grown since then. 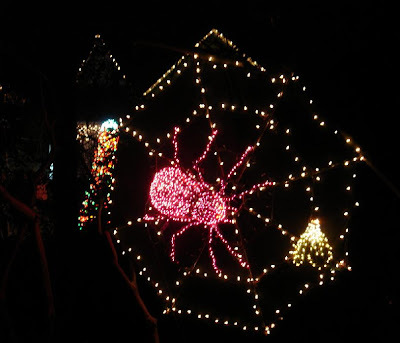 The entire gardens have been decorated, with flowers, trees, and fantastical creatures. Volunteers spent thousands of hours putting everything together, and they did a great job. 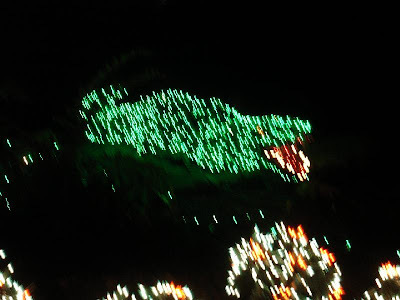 I tried not to use my flash, so the poor crocodile is a little blurry. It was a great way to get into the festive season!